Kentucky senator and alleged yard-work offender Rand Paul has waded into the confirmation fight over Judge Brett Kavanaugh, President Trump’s pick to replace Anthony Kennedy on the Supreme Court. In an interview with Politico published on Sunday, Paul said that he wasn’t sure whether he could support Kavanaugh because of the potential justice’s views on civil liberties, one of the sometimes-libertarian-ish senator’s central areas of policy interest. Kavanaugh does indeed have a long history of siding with the interests of the national-security establishment, brushing off any and all privacy concerns. And with the absence of John McCain from the chamber, Senate Majority Leader Mitch McConnell maintains a 50-49 GOP majority, so, as long as Democrats stick together, he can’t afford to lose even one Republican vote. But in the case of Paul, it is unlikely that McConnell should be too concerned. And last summer, Paul complained that the GOP’s “skinny repeal” of Obamacare didn’t go far enough before claiming that the bill counted as a personal win, and voting for its passage after all. Paul did help kill the Graham-Cassidy version of Obamacare in September before it came to a vote, once again lambasting it as a half measure — though that proposal stood less chance of becoming law than skinny repeal. And he has cast one actual high-profile “no” vote against a Trump nominee: he declined to support Gina Haspel, President Trump’s pick to be CIA director, over her past role in torture. But neither of those rebellions compare to the prospect of personally torpedoing a Supreme Court nominee who could shift the balance of the court for decades. And Paul has shown that when the chips are down, he is likely to budge. Later in his Politico interview, the senator mused that despite his concerns, Kavanaugh probably wouldn’t be all that bad. 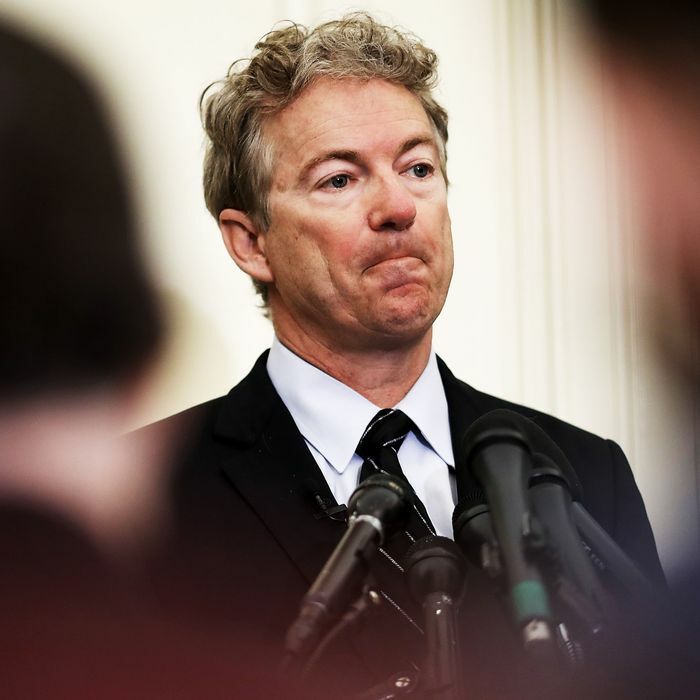 In other Rand Paul news, the senator tweeted that he would ask Trump to revoke former CIA director John Brennan’s security status after Brennan accused the president of treason following his disastrous Helsinki summit. Does this sound like a guy who’s about to openly defy the president?